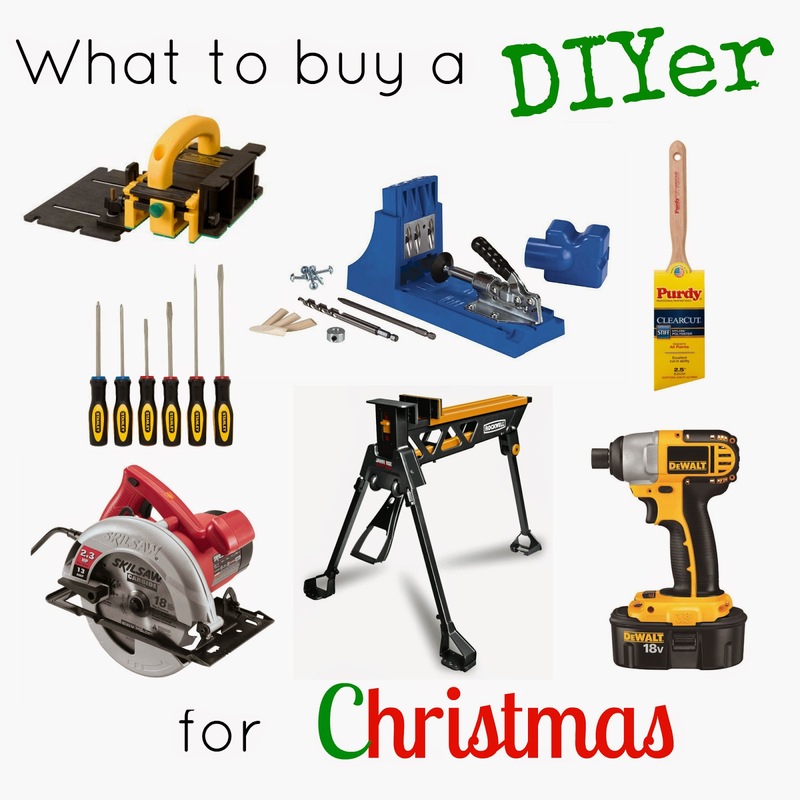 What to Buy a DIYer for Christmas + Giveaway! Keep scrolling for a chance to win a Simpson Strong-Tie Workbench and Shelving kit for yourself or someone else! Holy cow! How did this year go by so fast?! I get asked about tools a lot, so I decided to put together a few lists of my favorite, essential tools, breaking them into skill categories. All the links below are affiliate links, which means I make a very small commission if you buy the product. Although I may make a little money from selling these tools, I can honestly say I use EVERY SINGLE ONE of them on a regular basis. I am recommending them because I honestly love them! 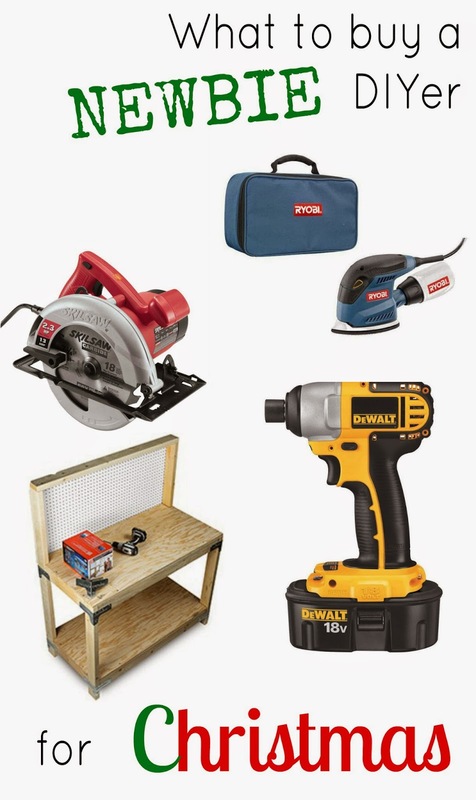 If you or someone you know is a "do-it-yourself" kind of person, these tools are essential. As of this morning, all of these items could still be shipped in time for Christmas! Most are available at your local Home Depot too, if you are into 'brick and mortar'. And for all you proactive people whose Christmas shopping is all done, no worries. You can use all that money Grandma sends you to buy new toys! 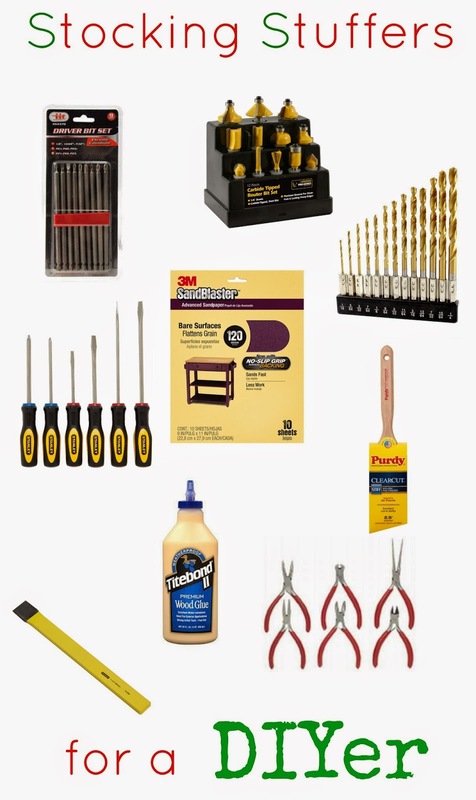 I could write an entire post, a long one, just about tools for the new DIYer. Although it would be really nice to go out and buy a whole garage full of new tools, I'm guessing that's out of the budget for most people. I came up with, what I think, are the the first 4 tool purchases every garage needs. Hands down, the most important part of a workshop is a sturdy work surface. You can buy a pre-made workbench, but building your own will be a lot cheaper, can be custom built to fit your space, and typically will be a lot stronger. Get yourself a kit, a few 2 x 4's, and some plywood, and you've got yourself a sturdy work surface. In a dream world, you would have both a cordless drill and an impact driver. A drill really should be your first purchase, but an impact is life changing! Every shop needs a circular saw. I personally like a corded one, so I never have to wait for a battery to charge, but corded or cordless, a circular saw will be one of the most versatile tools you own. Its great for ripping plywood as well as cross-cutting lumber. An electric sander is truely one of the greatest inventions since sliced bread! Different sanders are better for different jobs, but if I had to choose one, it would be a finish sander with a narrow point, like the Ryobi Corner Cat. If you give a mouse a cookie...well, you know the rest. The same goes for tools. 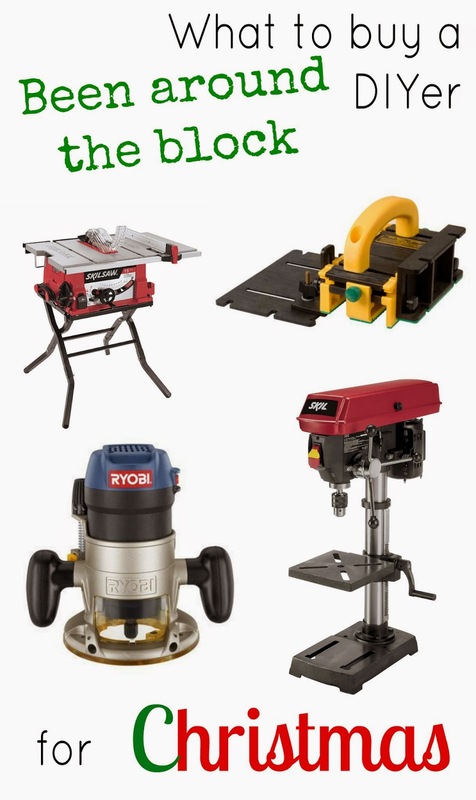 Here's a list of great gift options, when you're ready to step up your game in the DIY department. A pocket hole jig lets you join wood together, quickly and tightly. There is a reason why you see Kreg jigs all over DIY blogs. It is game changer, especially if you want to build or repair furniture and cabinets. Oh, how I love clamps! With some projects they're helpful, and with some they are down right essential. Everyone could use a set of ratcheting bar clamps. Ever need a third (or forth) hand? A couple good sawhorses are more than handy. I use mine for cutting sheets of plywood, painting, and sometimes as a second workbench. Perfectionists will love a good miter saw. Although you can cut almost any angle with a circular saw, a miter saw allows you to cut them quickly and almost perfectly. A must-have for cutting moulding. Once you can check these tools off your list, you have just about everything a weekend warrior would need. After this, you can just start at the beginning of list and upgrade. A table saw opens a whole new world of DIY. Ripping plywood down to a manageable size makes woodworking at lot more enjoyable. If you are getting into furniture building, a table saw should be on your short list. Have you seen a video of the Gripper? Man, this thing is cool. It makes your ripping so much more precise, and safe. It's a push block and jig, all in one. My husband scored a large, industrial drill press when a lumber warehouse went out of business, a few years ago. Since then, I have fallen in love with a drill press. Since I have started working with metal, I couldn't love my drill press more. I can drill holes quickly and more precisely than I ever could by hand. A router is one of the more versatile power tools around. Most people think of decorative edges, but a router can trim, join, and plane wood and MDF like a champ. Yes, tools can be pricey, but there are dozens of inexpensive gifts that a DIYer would love. Here's a list of some ideas that I would love to find in my stocking (wink wink). Now its your chance to win! One of the most basic essentials for any DIYer is a good workbench and everyone could always use some more storage. 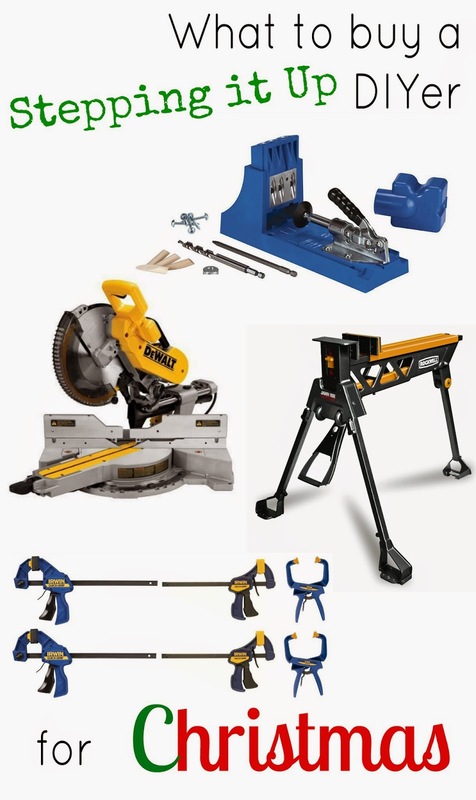 Follow the Rafflecopter below for your chance to win a Simpson Strong Tie WBSK Workbench and Shelving Hardware Kit. Your emails are so informative and so helpful! Thank you for thinking of our needs!!! You've given me several helpful tips and hints. Love the stocking stuffer ideas today! I love the Antico pillow! Love the lily scroll pattern. I'd go for the Julia stencil. Stephanie's Lace Paint a Pillow is my favorite! I'm assuming my question is different than the others lol. But I would gift this to my younger cousin who is wanting to start a business out of his DIY work. He's at the hospital with his wife awaiting their son. This would be amazing to give to them!